"A fast-moving tale about the world of rare books. A wonderful story with absolutely superb casting." "Gruber deftly raises the thriller stakes and accelerates the plot while still creating convincing personal journeys for his characters." "Michael Gruber pulls out all the stops (in) an elaborate game of cat-and-mouse." Car chases, shootouts and... old books? "An intricately crafted and literate work (that) should give the (thriller) genre a good shake. A rich cast of characters who are difficult to leave when the final pages are turned. Gruber is a master of his material. He sidesteps the obvious risks with disparate plot lines, and his remain unmuddied and ultimately join together naturally." "Fearless, intricate and intelligent. Stylish and confident prose. Realistic characters. Dialogue that respects a reader's intelligence. A smart and original plot. A smooth sense of timing, a healthy dose of skepticism, and by no means least a sense of humor." "If you love books, make room on the shelf for a new guilty pleasure. Smart, packed with excitement...Gruber mixes in fascinating details about rare manuscripts, intellectual property, and ancient and modern cryptography." "Not since A.S. Bayatt’s POSSESSION has an author so successfully combined literary puzzle, tempestuous duplicity, human adventure and good storytelling. In a thriller written with remarkable flair, Gruber serves up an elaborately layered and devilishly detailed masterpiece." "Breathlessly engaging...brilliant...few [thrillers] will surpass THE BOOK OF AIR AND SHADOWS when it comes to energetic writing, compellingly flawed characters, literary scholarship, and mathematical conundrums. 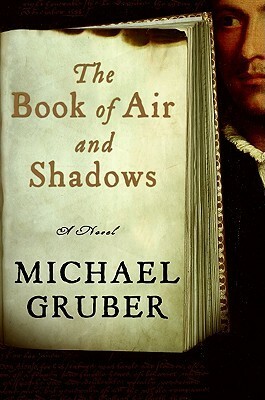 AIR AND SHADOWS is also incredibly smart....unpredictable...We never had this much fun reading The DaVinci Code. Gruber has raised the stakes in the thriller genre." "Another one of [Gruber’s] patently intricate thrillers." "A fire in a rare bookstore leads to the discovery of some letters from [Shakespeare’s] cousin...one of the many tantalizing threads in [this] narrative. At the end of this tantalizing run, you hope to hear from Gruber again soon." "A smart thriller. Readers will find themselves educated about the history of cryptology, from grille texts to Vigenere solvers...Gruber’s themes may be lofty but his people are fully fleshed. An engaging adventure." "A dead genius, a sleuthing couple with romantic chemistry, and some bad guys...it’s a fun party." "Ingenious...engaging...The mysterious murder of a Shakespeare scholar, shootouts in the streets of Queens and an unlikely romance all combine to make for a gripping, satisfying read." "(An) intoxicating mix of fact, fiction, secret codes and ancient conspiracies...well-written and cleverly told. A terrific thriller." "Gruber is no ordinary writer."